Once a sale has been arranged for delivery, it will appear within the Outstanding Deliveries (Stock, Movements, Deliveries, Outstanding Deliveries). 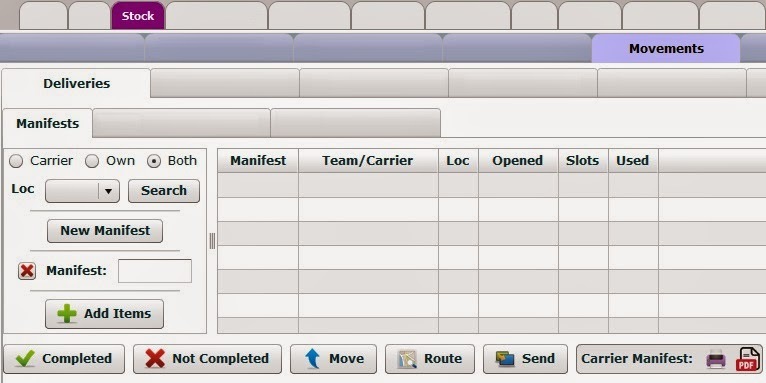 Select the Stock tab, Movements, Deliveries, Manifests. This will drop down a list of the delivery teams. 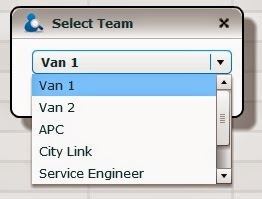 Select a team, then select OK. Enter any notes that are required to print on the Manifest. Select OK. It will show what Manifest you are currently in, if you have multiple manifests double click the manifest you want to be in. Adding Items to a Manifest. Select Add Items. This will take you in to the Outstanding Deliveries. From here you can select all deliveries from or to a branch if you have more than one location, if you want to show Deliveries, stock Transfers, Service Call-outs or All. Deliveries by dates, and specific deliveries for set teams. Enter any of the search Criteria (Usually you would be doing the Manifest for all deliveries for tomorrow (or today if you do the manifests in the morning) select the 'To Date' as tomorrows date, select Search, this will show you all deliveries for tomorrow as well as deliveries that are still outstanding - that may of been missed, or un-deliverable at the time and TBA's). Select the items you want to add to the manifest by ticking the box on the left hand side. 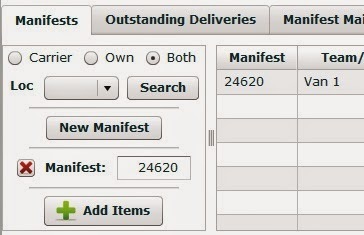 Then select the 'Add # items to Manifest' to add these items to your current manifest, you can select Add Items back in the Manifest screen to continue adding more items. Once items are on the Manifest you can print two different versions of the Manifest (Carrier and Own), Delivery Notes and Picking Lists. If the delivery wasn't completed, you can select the tick box, and select Not Completed. This will put the item back into the Outstanding Deliveries.